Indispensable: The vegetable peeler. I must have at least a couple of these, because they cost nothing, get lost all the time, and because I let my daughter have a go at peeling potatoes and carrots. A cheap, bamboo handled strainer from the Chinese supermarket. It´s used for frying, but I use it to fish out poached eggs, or to scoop boiled vegetables, or pasta, so I can use the water to boil something else, and something else again, and then use that as stock. My Ikea box grater. Ten years on the job, and it can still scrape a knuckle. The knife sharpener. Chaira, in Spanish, such an old, beautiful word. It makes me feel very cool just to use it, professional, even. There is no place in a home kitchen for ring moulds, squeeze bottles and foam syphons, but it makes sense to keep knives sharp and learn to use them well and quickly. Kilner jars, jam jars, pickle jars; they store chickpeas, flour, rice, sugar, almonds...I make labels for some, and my pantry looks ever so pretty. Tea towels. I have lots, and use them all the time. Why clutter the landfills with paper towels when you can use thick cotton cloth with pretty line patterns? Use a couple every day, toss them in the wash at the end, start over. Anyting enamel. Here aesthetics trump practicality, because I don´t allow enamel in the dishwasher and so must wash them by hand. But I love it so. I have cups, bowls, a huge bread bin, plates and pie dishes, and lust after a spoon but can´t find one. A whiteboard near the freezer, to keep an inventory of what´s inside the icy wastes. It was very useful until my daughter grew enough to reach the pen and now it´s full of doodles. Pouring tops for oil and wine bottles. Highly recommended. An old tin of Martinete tomatoes to have garlic and ginger on hand by the stove. And a small Chinese porcelain cup my mother gave me, antique, beautiful. I used it to drink tea, but it broke, so now, stuck together, it houses the salt. A cheap plastic scraper for baking, so handy and so right. The stainless metal one with the handle is an affectation, but it is actually very useful for scooping stuff from cutting board to pan. My favourite wooden spoon, yew, golden and strong and with the perfect balance. I wish I´d bought a dozen when I got this one in Alambique. And a short one, that only gets used on sweets. My four kitchen notebooks. Four, because the other three are filled with recipes I want to keep, notes on various dinners, labels I like, the odd magazine article or photo. It´s sometimes hard to remember where a particular recipe may be, so I have an address book with a partial index. A step. Because this kitchen was designed by a madman, I need it to reach the upper parts of the cupboards. My daughter uses it to stand beside me when they cook (my son drags a chair). Mechanical whisks. I have two, both vintage finds, both gorgeous, but nothing as beautiful as my porcelain rolling pin. Much love. The apple cutter/corer. A one trick pony, yes, but the one trick means that my kids agree to eat "flower apples". A wooden mortar and pestle. It´s just right for crushing a garlic clove to dress a salad, or a few almods. I'm not one of those who extol the virtues of hand made alioli, thankyouverymuch, but this is a very pretty mortar and the pestle has a hole from a fault in the wood. The tin opener, "el explorador", a Spanish classic. Essential in this benighted country where most tins don't come with the easy pull off handle. Six jelly moulds from John Lewis, with two lids, in pretty colours. These get a weekly outing at least, even though one of the lids is lost and unset jelly often spills in my horrible, tiny, overstuffed fridge. This is just stuff I love, the things that always surprise me with their perfect selves. 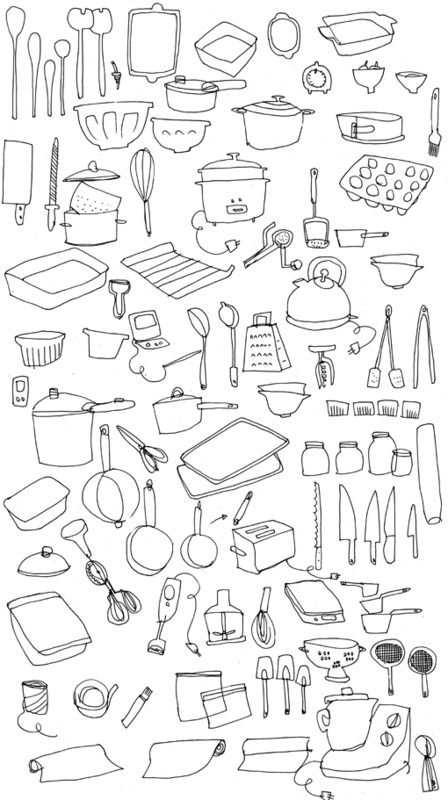 Of course I have tons of other things, pans, pots, baking trays, measuring cups, timers, thermometers, spatulas and paring knives that are always getting lost, pressure cookers and rice cooker and blender and Thermomix and digital scales. I would never advocate one of those spare, bowl/knife/board kitchens. But the ones I´d save from a fire are simple, low tech things that have been around for years. Posted by lobstersquad at 10:54 a. m.
We are alike in many of the things we consider favorite. I too hate washing up my enamel baking pans and spoons (yes, I have a couple of them, sorry to rub it in) but I just love how they look. Beautiful tribute to the most-loved items in your kitchen. Cooking with things we treasure puts special flavor into the food. Whiteboard is a flipping genius idea. Have just tidied kitchen, giving pride of place to my small teapot collection. Can I face the freezer as well...? Magda: hi, so glad, thank you. Very jealous of the enamel spoons, grrr. And btw, there are photos of my kitchen in Lydia's blog, I'll post links. Lydia: it makes all the difference, cooking with nice things, yes. Hello again. I saw this and thought of you. I think you just found what you were looking for! Loved reading this post! It was like getting a little peek into your kitchen, and your life :) I also have my favorites and yes, those things that have been around for a long time, or have sentimental value, can be found at the top of my list as well! Great drawing. You should turn this into a tea towel. I particularly like the face on the rice cooker. This is quite a list you have here. I also can't live without my mechanical whisk.